Great for high school students, this complaint letter argues against closed campuses during lunches and off periods. 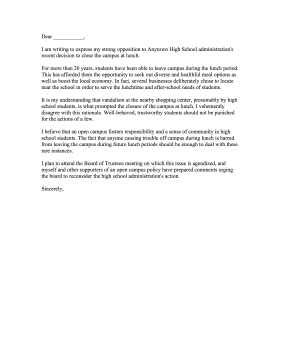 I am writing to express my strong opposition to Anytown High School administration's recent decision to close the campus at lunch. For more than 20 years, students have been able to leave campus during the lunch period. This has afforded them the opportunity to seek out diverse and healthful meal options as well as boost the local economy. In fact, several businesses deliberately chose to locate near the school in order to serve the lunchtime and after-school needs of students. It is my understanding that vandalism at the nearby shopping center, presumably by high school students, is what prompted the closure of the campus at lunch. I vehemently disagree with this rationale. Well-behaved, trustworthy students should not be punished for the actions of a few. I believe that an open campus fosters responsibility and a sense of community in high school students. The fact that anyone causing trouble off campus during lunch is barred from leaving the campus during future lunch periods should be enough to deal with these rare instances. I plan to attend the Board of Trustees meeting on which this issue is agendized, and myself and other supporters of an open campus policy have prepared comments urging the board to reconsider the high school administration's action.